I was browsing the interwebz and came across this article. I've re-formatted the text and externally hosted the images to try and make this information a bit more useable and long lasting. You can view the original text here. There are lots of other articles on that site as well, but it is a chore to copy it all across and mess with all of the images. Plus you best be proficient in engrish. Anyways, do enjoy! This article has some interesting stuff! MC has 3 types of engine. 2 for gasoline. 1 for Diesel CRDI. As we already know, MC's gasoline is not for the first used in HMC. It is alredy adopted in several vehicles without CVVT model. Alpha 1.6 and 1.4 DOHC are designed by HMC and now producing both HMC and KMC. The assembly line of this engine is in Ul-San plant. This engine has been quite widely used in HMC side. 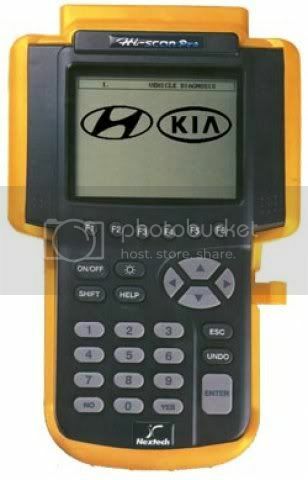 Available model of this engine is Matrix, Gets, Accent, XD Elantra and so on from 1993. That's why it has a lot of reliability in quality. Now we are developing 3th generation of this engine. Project name is Gamma with timing chain system. You can see this Gamma engine from 2006. In case of MC, 2nd generation of Alpha engine is used. Basic mode of Alpha is 1.5 but it has three more 1.3, 1.4 and 1.6 liter. Except 1.3 & 1.4 liter both 1.5 and 1.6 liter have CVVT system. But only 1.6 liter with CVVT engine is used for MC export. 1.5 liter with CVVT is only for domestic. 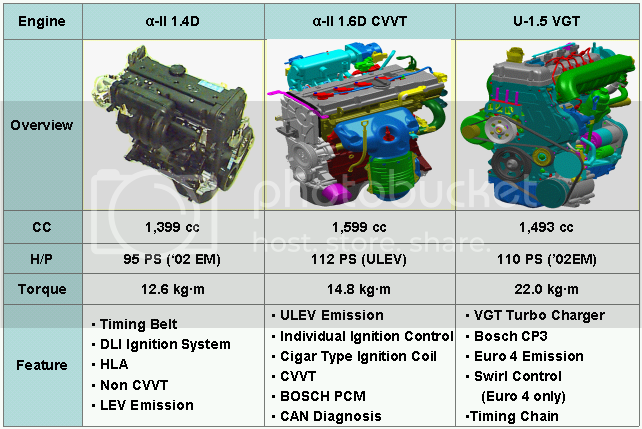 U 1.5 liter CRDI engine is quite new one. Main target area of this is for European and domestic. Amazingly it can produce 110 ps target horse power with 1.5 liter. New technology with this is VGT turbo charger with CRDI CP3 system. It has 3 line-up by engine displacement. 1.1, 1.5 and 1.6 liter. Later we will introduce euro 4 emission engine with this. 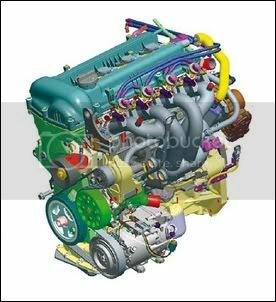 On main moving parts such as piston, piston ring, camshaft, crankshaft, connecting rod, cylinder head, cylinder head gasket and cylinder block, any parts can not be shared together between 1.4 and 1.6 liter. To distinguish cylinder block from 1.6 to 1.4, refer to no. 4 cylinder block side to find encrypted letter such as 1.4D/1.5D or 1.6D. 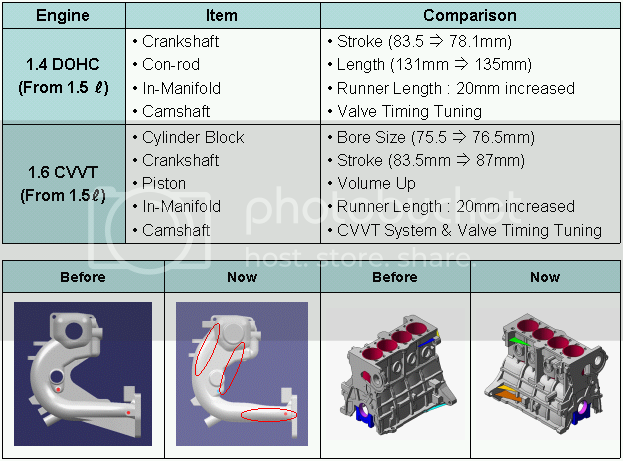 1.4 and 1.5 cylinder block can be changeable not for 1.6 liter. 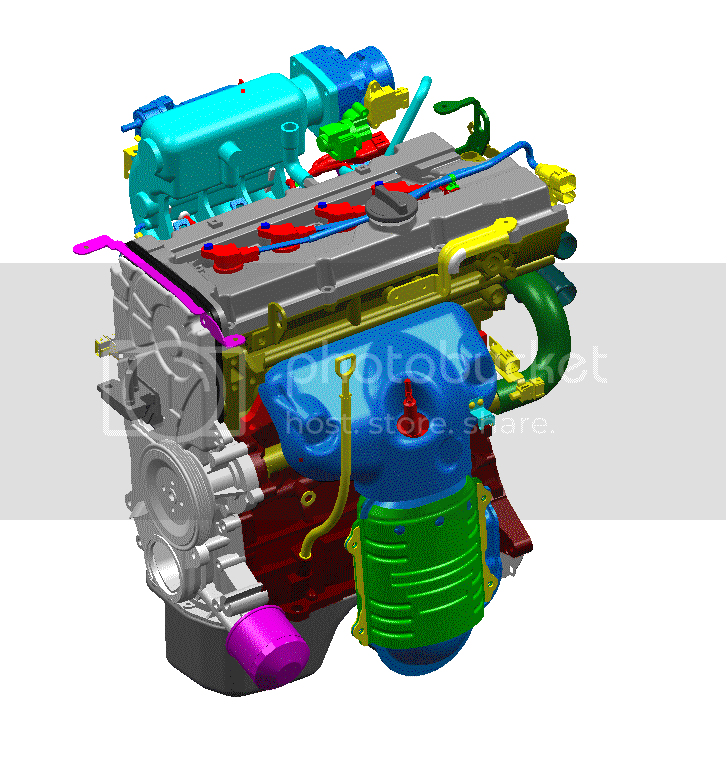 The reason why those can not be inter changeable is mainly from adopting CVVT system and enlarged cylinder bore size in 1.6 liter.Only Intake and exhaust valve mechanism related items can be shared together. Graphite coated piston is used so as to increase lubrication and decrease slapping noise since there was some noise and oil consumption problems before with alpha engine without any graphite coated piston. Camshaft target wheel in 1.6 liter has 4 target wheel. Each duration from low to high, high to low has 180 degree increasing more control accuracy with CVVT control. In case of 1.4 liter dowel pin type target wheel is still used. 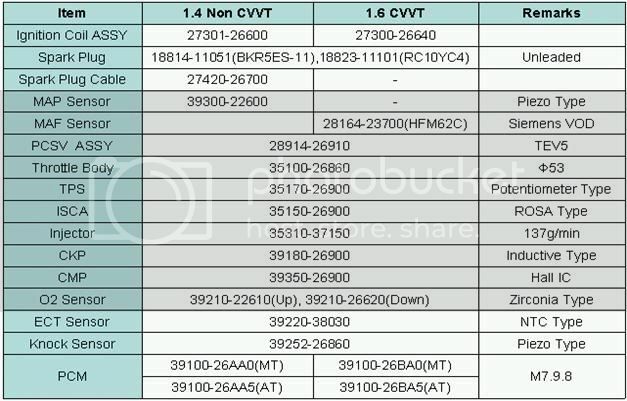 In case of Alpah 1.6, Bosch M7.9.1 version of software is used but JB uses Bosch M7.9.8 version with CVVT system. Main features of M7.9.8 are 2 chips CPU, 400MHz internal clock, waterproof, 24 channel A/D converter, 2 CAN Module, 154 pin connector, wheel speed sensor interface integrated, 768K flash memory and so on. To make communication to PCM with hi-scan pro, you must use can interface module since CAN communication protocol is used instead of KWP2000 for DTC only in Gasoline engine. Using can protocol communication speed is increased from 10kbps to 38.4kbps. There are two terminals for CAN communication in 16 OBD 2 connector. So when you try communication, you must use this. Individual ignition system is applied to 1.6 liter only so as to increase efficiency and accuracy in control. TR is in ECM side. 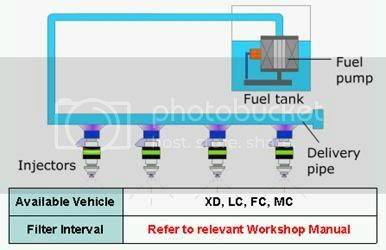 Because of the circulation of fuel from fuel tank to heated fuel delivery pipe, conventional return type fuel system compared to RLFS which fuel is regulated in fuel pump module inside of fuel tank can produce much more evaporated high temperature gas. Reducing circulating fuel line as shown in the picture, RLFS maintains lower fuel temperature and reduces evaporative gas by 25 ~ 30%. 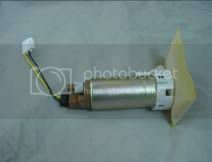 Main items consist of RLFS are fuel pump module including fuel filter and fuel pressure regulator submerged in fuel tank. Inductive type CKP sensor is used. Typically when you use Bosch EMS system, CKP sensor type is from inductive type contrary to Siemens of hall IC type. Of course these days there isn't any board to share both hall or inductive in CKP sensor. Main reason why Bosch prefer to use inductive type is it doesn't need any power supply for sensor operation. For example a vehicle is driving on rough road, suddenly micro cut off happens in power supply to sensor then the vehicle will stall immediately because of no power to sensor in hall IC type. On the other hand, since inductive type doesn't need any power supply the vehicle will still move. When it comes to MAF sensor, sensor supplier is changed from Bosch to Siemens. In case of previous Bosch HFM 5 type revere flow detection MAF sensor, even though it has more accuracy but sensor tip can be easily damaged by foreign materials resulting in fuel system problems. Sensor reliability is increased using Siemens MAF sensor but accuracy can be lower than Bosch's. When you install MAF sensor you must be careful to installation direction. Other sensors or actuators are no differences except individual ignition system which is newly adopted. Vehicle sensor signal recognition is a little different. When ABS or OBD system are applied to the vehicle, wheel speed sensor is used for vehicle speed instead of VSS. 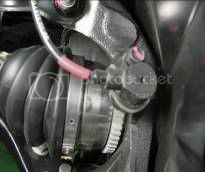 This wheel sensor is also used for misfiring detection like typical acceleration. The VSS which is mounted on T/M housing is for only cluster's vehicle speed information purpose. Signal input lines are also quite different by vehicle specification. Refer to above table for input pin assignment. 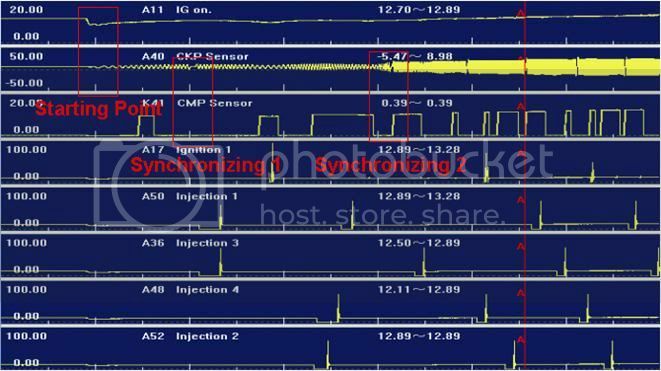 When start motor is rotating, CKP signal from CKP sensor is coming to ECM. When first both CKP and CMP signals come to ECM, injection starts and ignition follows. As you seen in this picture CMP signal acquisition is a little different because of target wheel shape. This is only for 1.6 with CVVT. In case of 1.4 liter dowel pin type target wheel is still used. CKP sensor is from inductive type but CMP sensor is form Hall IC type which is used by hall effect. Syncro.State(CKP/CMP) in hi-scan pro current data is for ECM's logical thinking related on Synchronizing. On means it doesn't have any problem in synchronizing. It is quite useful when you have starting problem. 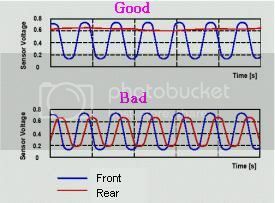 Camshaft position is for set point of CVVT. Initially it shows -8 deg. Right side picture will be changed. Zirconia type oxygen sensor is used. 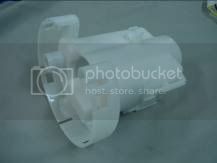 It is made of zirconia (zirconium dioxide), platinum electrode, and a heater. 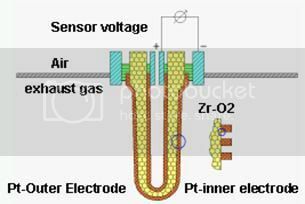 This oxygen sensor generates a voltage signal based on the amount of air in exhaust compared to the atmospheric oxygen. The zirconia element has one side exposed to the exhaust stream, the other side is connected to atmosphere by wires. Each side has a platinum electrode attached to zirconia dioxide element. The platinum electrodes conducted the voltage generated. Contamination or corrosion of the platinum electrodes or zirconia dioxide elements will reduce the voltage signal output. When exhaust oxygen content is high, oxygen sensor voltage is low. When exhaust oxygen content is low, voltage output is high. The greater difference in oxygen content between the exhaust stream and atmosphere, the higher the voltage signal. From the oxygen content, the ECM can determine whether the air fuel ratio is rich or lean and adjust the fuel mixture accordingly. A rich mixture consumes nearly all oxygen, so the voltage signal is high in the range of 0.6 ~ 1 V. A lean mixture has more available oxygen after combustion than a rich mixture, so the voltage signal is low in the range of 0.4 ~0.1V. At the stoichiometric air fuel ratio (14.7:1), voltage output is nearly 0.45V. Rear oxygen sensor is the rear side of catalytic converter to check the proper operation of catalyst. Oxygen density after the catalytic converter has to be within specific range around 0.5V when there is no acceleration or deceleration. If the oxygen density changes in accordance with front oxygen sensor, it means the poor performance of catalytic converter. There are two different fuel trim values that affect final injection duration and can be observed by the technician through hi-scan pro's current data, short fuel trim (Short F/T), and long term fuel trim (Long term Idle or Long term P/Load). Short term F/T is a temporary addition or subtraction to the basic injection duration following by oxygen sensor's feedback. Long term F/T is part of the basic injection duration calculation and it is stored in the ECM's memory. As short term is based on the oxygen sensor's feed back, it only functions in closed loop. It responds rapidly to changes in the oxygen sensor. If short term is varying close to 0%, little or no correction is needed. When short term percentage is positive, the ECM has added fuel by increasing the duration. A negative percentage means the ECM has subtracted fuel by decreasing the injection duration. The short term value is temporary and not stored when the ignition key is turned off. Also short term is used to modify the long term f/T. When the short term remains higher or lower longer than expected, the ECM will add or subtract this value to the long term F/T. Long term F/T is stored in ECM memory and it is not erased when the ignition key is turned off because it is part of the basic injection duration calculation. It affects injection duration both closed loop and open loop. The ECM uses the short term F/T to modify the long term F/T. It does not react rapidly to sudden changes, it only changes when the ECM decides to use the short term F/T value to modify the long term F/T. Like the short term F/T, when long term is at 0% there has been no modification to the basic injection duration. A positive percentage means the ECM is adding fuel; a negative percentage, subtracting fuel. Long term is used to control injection duration over the entire range of engine operation. It is divided into two ; Long term Idle and Long term part load by engine load. Long term idle is monitored under less than 920 rpm and 24 kg/h of air amount. 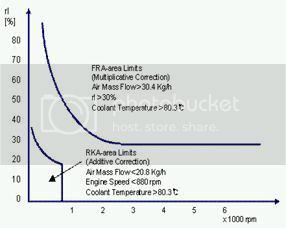 Add or subtract control is used at this range since the inhaled air amount is relatively small. Unlike long term idle, Long term P/load is monitored over 30 ~ 75% of engine load and 40 ~200kg/h of air amount. Multiple correction control is utilized with this. Unfortunately, no. This article concerns the MC only, if there is a goldmine of info out there for the SOHC, I'd love to see it! I have a question. 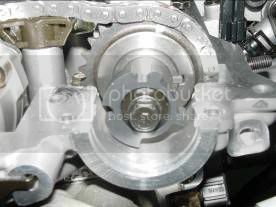 Is there a bigger throttle body out there that will fit my 1.6 alpha??? P.S. really good info. Added it all to my mech folder.